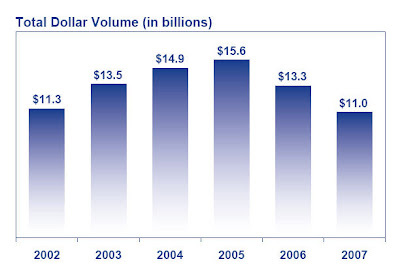 Today the Residential Real Estate Activity Report for 2007 was released by the Minnesota Association of Realtors. It tells us what we all knew was happening. Listings stayed high, while closed sales took a nose dive. To put it in numbers, over 105,000 listings were for sale, but only 40,055 closed. That’s roughly a sale rate of 38%. In the last few months, I have had people ask me about the market. I have always told them that while the market is down, we are back to 2002 sales levels, which in itself wasn’t too shabby of a year. Low and behold I was right on the money! We all new the roller coaster ride had to end sometime. Now we can look back the last five years and follow the trends. Trends typically follow a sine curve, so it will be interesting to see if 2008 will be the year we hit bottom. 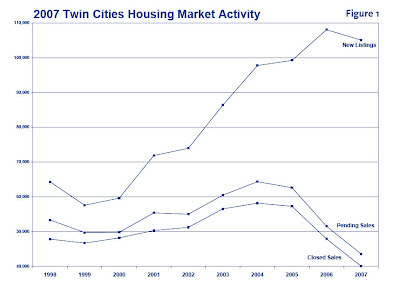 With record sales the last five years, we can also see what areas of the Twin Cities sold the highest volume of homes. NO big surprise but the Lake Minnetonka area tops the list. Homes around the lake have sky rocketed, with older homes being torn down and being replaced with mansions. Other areas have seen the same trend, especially in Edina. There have been a couple controversial tear-downs the last two years. The next installment will look at appreciation levels and housing affordability. I’m working the rental real estate market these days and things couldn’t be better! I’m amazed how few Realtors are actually looking at the Rental market as a great income source. Whether handling lease-ups or working with Investors to purchase rental property, the great thing about this market is that it runs opposite the buy/sell market. If you can jump back and forth between each market when times are up for one and down for the other, you’ve got a pretty consistent income! It appears your area faired well through the last year and this real estate bubble. I’m not surprised that the vacation and lake areas did well. Luxury homes sales remain mostly untouched by recent Option ARM lending foreclosures. I to hope that things will level out and slowly climb again. Rentals Guy – one market here that is very lacking in real estate involvment is the rental market. Our MLS will not allow rentals into the system, and I think this is very stupid. Having the data in one MLS location makes it so much easier to surf, rather then hitting Craigslist which is so hard to navigate. The rental market is booming and is a great niche to be in right now! Karen – the Twin Cities was not hit as hard by the housing decline as Florida was. I am licensed in Florida and used to live in the Panhandle. I saw the market crash really hard in 2005 and it hasn’t yet recovered. Luckily, the Minneapolis market came to a bounce, instead of a crash!